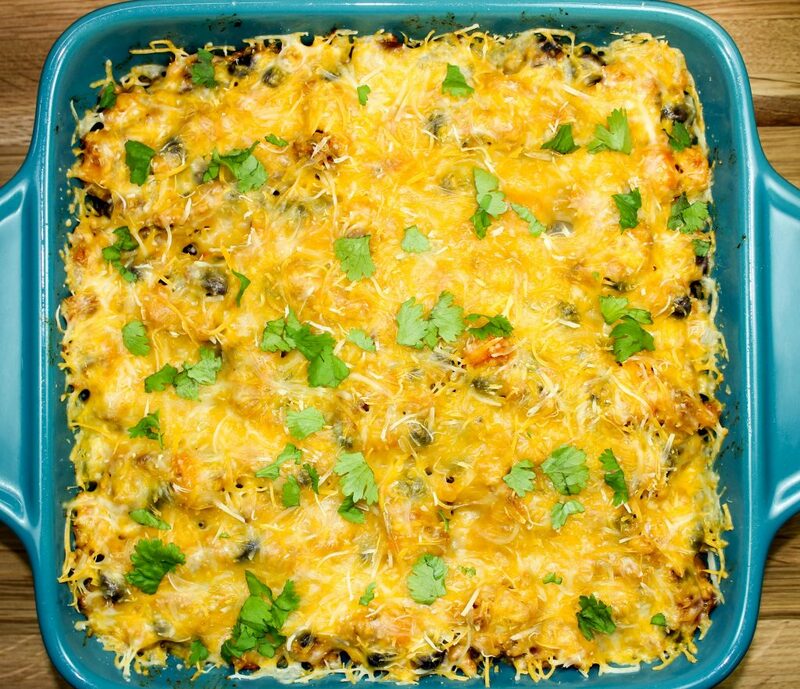 Tex-Mex Turkey Quinoa Casserole is delicious and hearty dish. 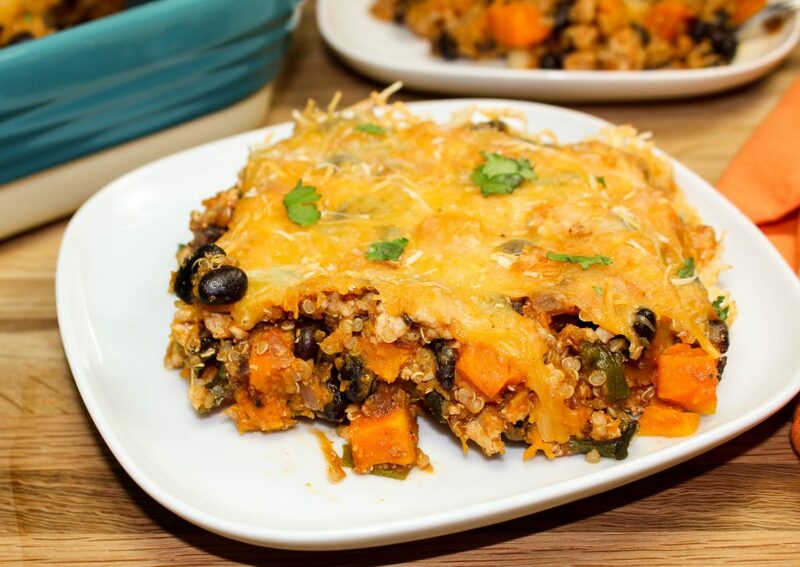 Turkey, quinoa, veggies, and Tex-Mex spices make a scrumptious healthy casserole. Weight Watchers friendly- 5 SmartPoints! I love a good casserole, don’t you?! Casseroles are for days when I have a ton of random ingredients and just want to throw them all together in a dish, bake, and be done with dinner. Another reason I love casseroles is they can feed me for days! My Tex-Mex Turkey Quinoa Casserole is delicious, hearty, and packed with Tex-Mex flavors. 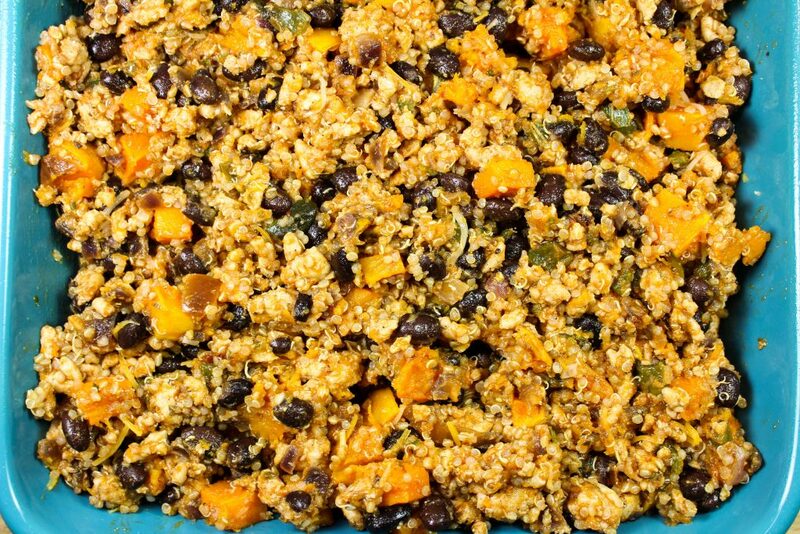 Spiced ground turkey, roasted peppers, black beans, squash, quinoa, and Tex-Mex spices mixed together make a scrumptious yet healthy casserole. This is a Weight Watcher friendly recipe and each serving is 5 SmartPoints. Not only are casseroles great make ahead meals but they also can feed you for days! Don’t get me wrong, I love to cook, but it’s just my husband and I so when I make a casserole we are guaranteed to be fed for days. Making casseroles basically gives me a few days off from cooking 🙂 . I try to make a casserole at least once every few weeks when I know I will be busy in the evenings and won’t have time to make dinner. Sometimes I will make a casserole the night before, store it in the fridge, then pull it out and bake it for dinner time. This saves me a ton of time! My inspiration for this Tex-Mex Turkey Quinoa Casserole came on a day when I really wanted to make tacos but didn’t have any tortillas. I usually always have tortillas on hand because I crave tacos at least once a week! I was craving taco flavors but needed to rethink my whole game plan. Usually when I’m faced with this dilemma, I just make a casserole of sorts. That’s why I love casseroles… I can basically just throw a bunch of random ingredients together and make something delicious! 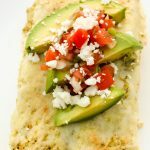 This recipe has a few steps to follow but the beauty of this recipe is that you can easily make this ahead of time and you can even do a few of these steps on Sunday for weekly meal prep! The first step is to roast butternut squash. I always do this step on Sunday when I do my weekly meal prep. 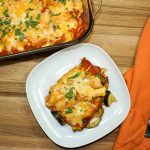 After you roast the squash, just store in your fridge and pull out when you are ready to make this casserole! I just LOVE adding butternut squash to any dish. I add butternut squash to a lot of dishes because it’s delicious, super low in Weight Watcher Smart Points and a great fuller ingredient to dishes like this. 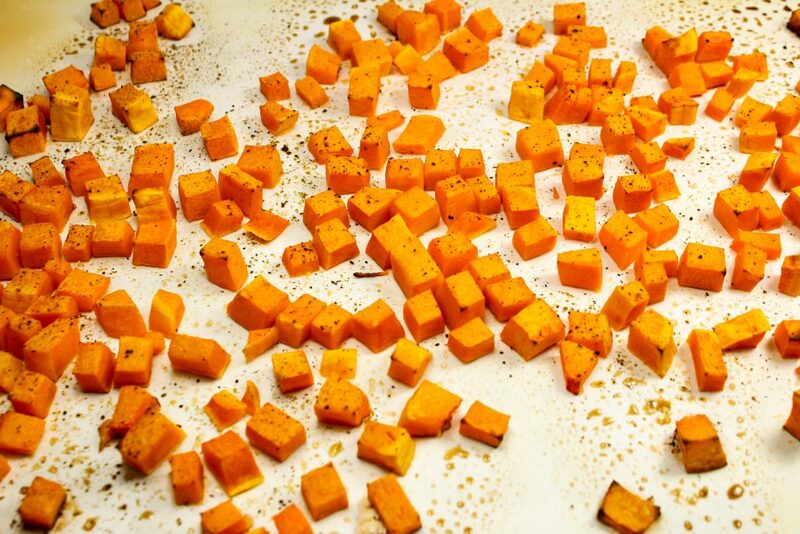 To roast butternut squash, peel the skin off, remove and discard the seeds, then cut the squash into ½ inch cubes. If you have never peeled butternut squash, check out this link for a great tutorial! Spray a baking sheet with cooking spray, spread the squash onto the pan in an even layer, spray the top with cooking spray, season with salt and pepper, and then bake for 25 minutes. In the same oven, roast the poblano peppers. I cannot get enough roasted poblano peppers… it’s a real game changer adding this ingredient to Mexican/Tex-Mex dishes. Roasting these peppers adds such a deep and smoky flavor to any dish. So good! You could also do this step on Sunday for weekly meal prep. After you roast the peppers, just store in your fridge and pull out when you are ready to make this casserole! Roasting peppers is super easy too, trust me. On another baking sheet, spray with cooking spray, place poblano peppers on sheet and roast in the oven for 25 minutes. After poblano peppers have baked, wrap with foil so they can sweat for 25 minutes. Once the peppers are cool enough to handle, gently remove the skin and seeds, then dice. While the peppers are sweating, cook the quinoa and ground turkey. Again, these steps could also be done on Sunday for weekly meal prep! 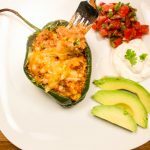 In a large bowl, mix the roasted poblano peppers, roasted squash, quinoa, black beans, ground turkey mixture, tomato sauce, chipotles in adobo sauce, and spices then spread into a casserole dish. Sprinkle the top of the casserole with CHEESE and bake for 25 minutes! 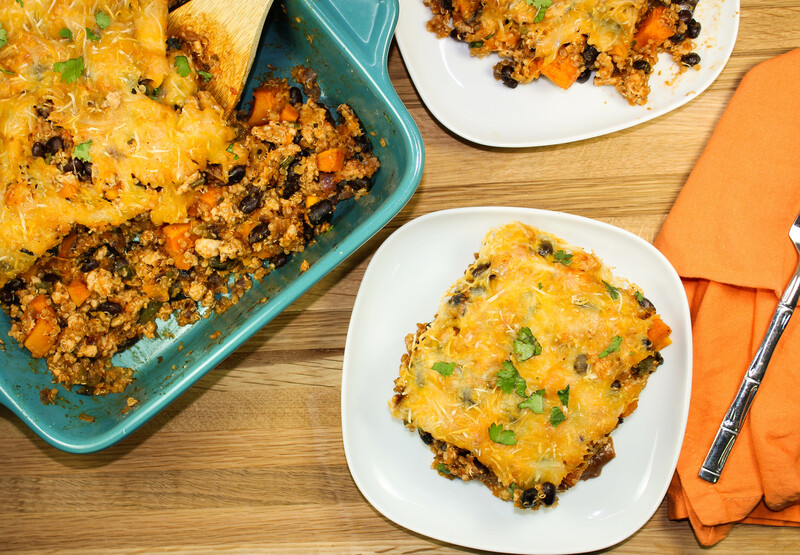 Tex-Mex Turkey Quinoa Casserole is delicious, hearty, and packed with Tex-Mex flavors. Spiced ground turkey, roasted peppers, black beans, squash, quinoa, and Tex-Mex spices mixed together make a scrumptious yet healthy casserole. This casserole can easily be made ahead of time for a quick weeknight meal. Freezer friendly and great to feed a crowd! Peel butternut squash, scoop out seeds, and dice into ½ inch cubes. Spray baking sheet with cooking spray and spread out squash cubes onto sheet. Spray top with cooking spray and season with a pinch of salt and pepper. On another baking sheet, spray with cooking spray and place poblano peppers on sheet. After butternut squash in roasted, remove from oven and set aside. 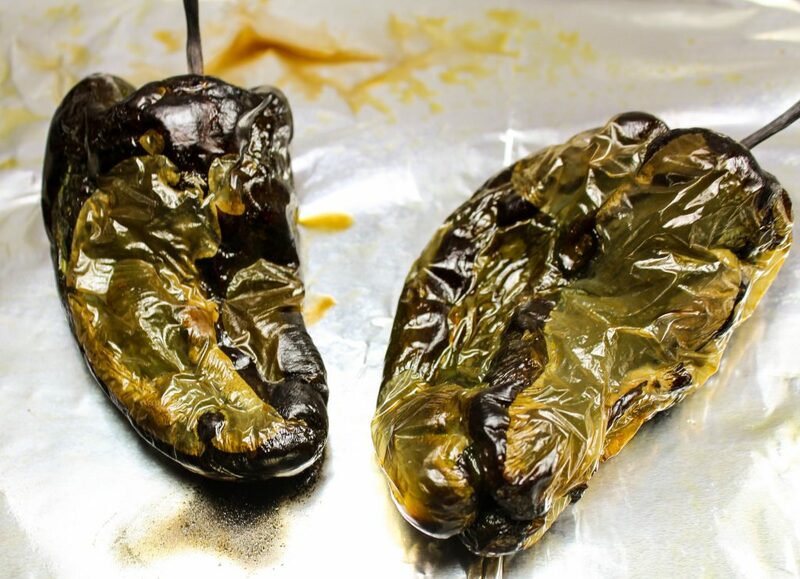 After poblano peppers have baked, wrap with foil so they can sweat for 25 minutes. Once peppers are cool enough to handle and gently remove the skin. Gently remove the seeds from the peppers and dice into small pieces. Set aside. While squash and peppers are roasting in the oven, fill pot with 2 cups of water and quinoa. Bring to a boil then reduce heat to simmer, cover, and cook for 25 minutes. Dice jalapeno and onion and set aside. Heat skillet over medium heat and add oil. Add onion and jalapeno and sauté until onions are translucent, about 7 minutes. Add garlic and sauté for 2 minutes. Add ground turkey, season with salt and pepper, and cook until browned, breaking up turkey into small pieces. Add tomato sauce and liquid from chipotles in adobo. Mix until well combined, reduce heat to simmer, and cook for 10 minutes. Into a large bowl, mix roasted butternut squash, roasted poblano peppers, ground turkey mixture, black beans, cumin, Mexican oregano, and smoked paprika. Spray 9x13 casserole dish with cooking spray and spread mixture in dish into an even layer. Sprinkle the top of the dish with cheese and bake for 25 minutes. Garnish with cilantro and sour cream. Sour cream is not included in the Weight Watchers nutrition calculation. February 2, 2017 at 2:10 pm This looks SO good. I love that it has Quinoa in it -- a healthy twist. February 3, 2017 at 9:57 am Yes!! I love quinoa in any dish! February 2, 2017 at 3:37 pm This looks so good! 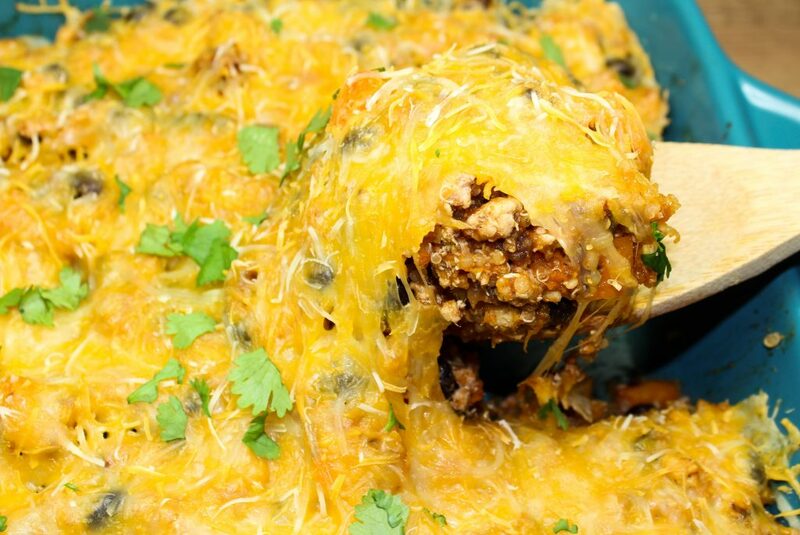 I love Mexican food and a good casserole is so helpful for weeknight meals. 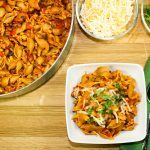 February 3, 2017 at 9:56 am This dish is the perfect combo Jacki! February 3, 2017 at 9:56 am YAY! I hope you enjoy the dish! February 3, 2017 at 9:55 am It really is! Squash is a great filler ingredient for dishes like this!